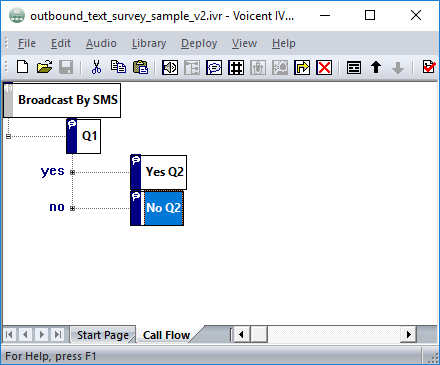 Voicent IVR Studio is the most complex tool on our platform. It is actually a full developer tool with support for programming. However, most text survey apps are not that complicated and there is no need to learn the full scope of the tool. 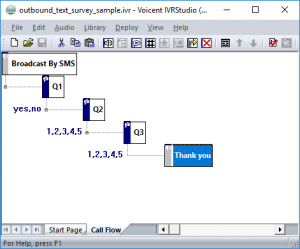 But if you want to learn the full scope of the tool, please take a look at IVR Tutorial. But for most users, just take a look at chapter one of the tutorial. The following sample IVR app is a simple 3 question survry. This can be served as your starting point. Please also note we offer full design service for creating your survey app. For more details, please contact our sales. 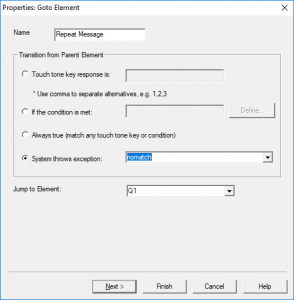 If someone presses key 9 instead of the specified range 1 – 5, the system will send back some default message. If you want to change the prompt, you can add a go to element/node to handle that situation. 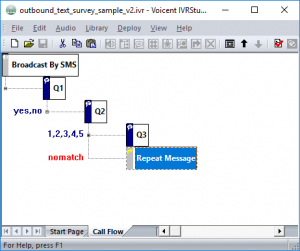 The following is the updated call flow. 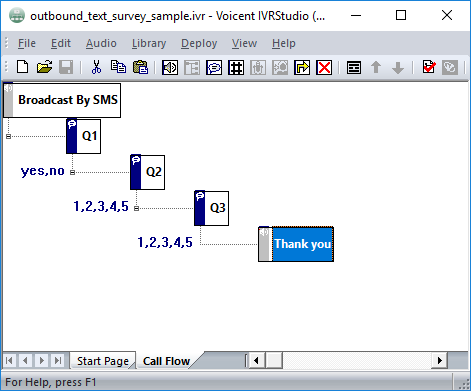 For IVR phone survey samples, please see here. This entry was posted in SMS Usage. Bookmark the permalink.